Unfortunately, our day in Lewes was one that the Cannonball House (also a maritime museum) was not open for tours, but that didn’t stop us from seeking out the truly “Roadchicky” exterior of the building for which it was named. Surprisingly, it was hot during the beginning of our visit to Delaware. Really hot. 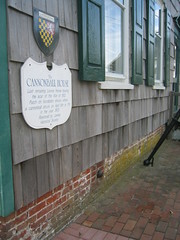 We’d already been to a couple of museums and shops and thought it would be a quick jaunt to the Cannonball house. However, the rudimentary map we were using for directions (a pamphlet from another museum) was missing some key street names and we wandered around in circles in the 95-degrees-and-humid heat for a good 30 minutes. After stepping into an air conditioned shop, we emerged refreshed to find the exact street we were looking for and wandered on to the Cannonball House. The house was a home and then also became a series of businesses and is now a museum. It is a rare example of one home in Lewes that has always remained in the same site. It was scarred by cannon fire in the War of 1812 and a cannonball remains lodged in the side of the bricks. It is small, unassuming, and close to the ground, so you could easily walk by and miss it. It also seems that it’s been cemented in place to deter souvenier hunters, but that makes it even more delightful as a roadside attraction.